… which is a picture of a winnow. Winnows, for those of you unfamiliar with agricultural implements, is a device used to separate the grain from the chaff, as well as remove weevils and other pests from stored grain. There are a couple of basic types of winnow, but in this case, the element ‘其’ refers to what is called a winnowing fan, a shaped basket used to toss the grain up into the air so the lighter chaff is blown away by the wind. Apparently it was a device associated to a table as well, judging by the pictograph. The character ‘箕’ then is a bamboo winnow, and is pronounced ‘mi‘. 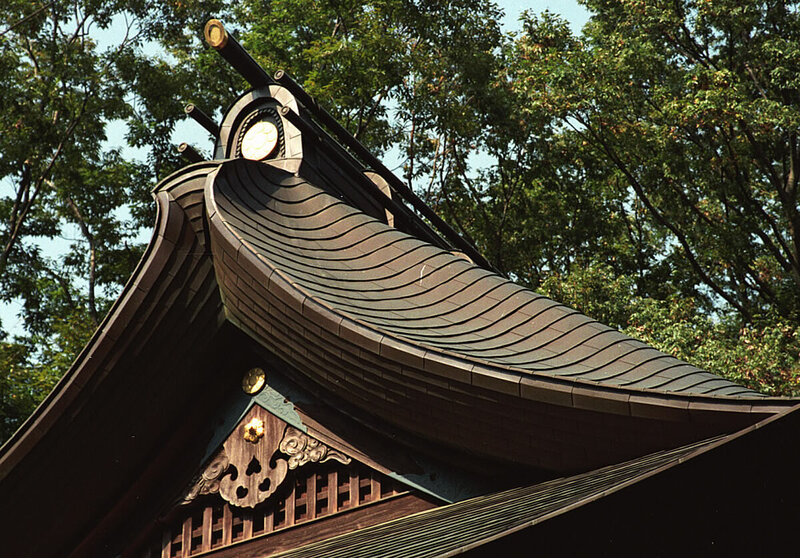 The minokō, described in English as a drooping verge, is a feature often found on Japanese gables and hip-gabled roofs. It comes in numerous shapes and styles. 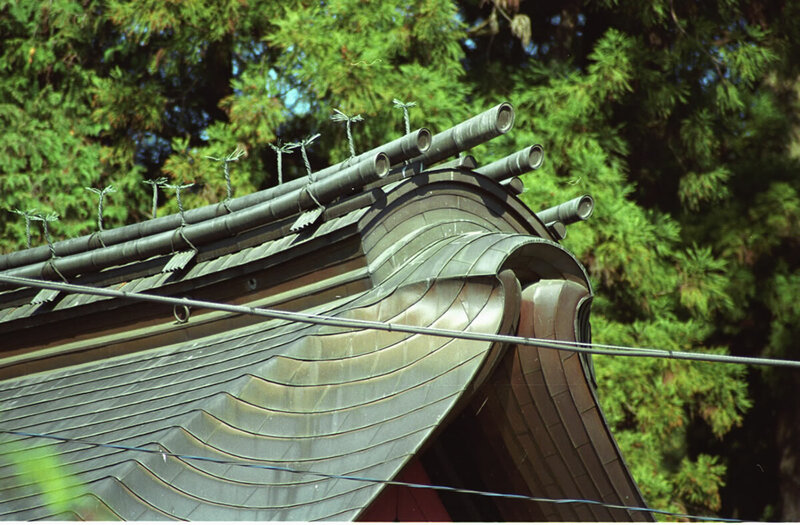 The purpose of the minokō is to transition between the edge of the barge board in the gable to the roof surface. 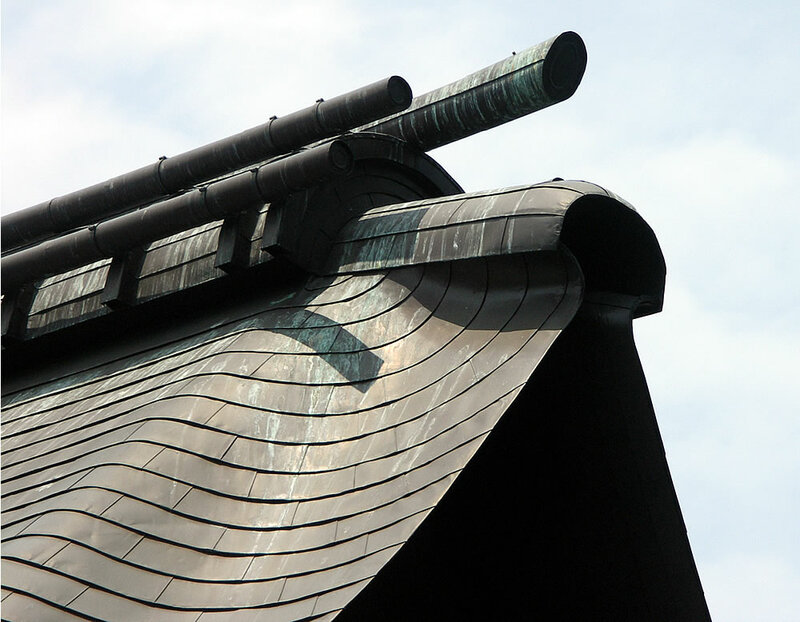 It is an artifact of the double roof system, and unique to Japanese architecture. 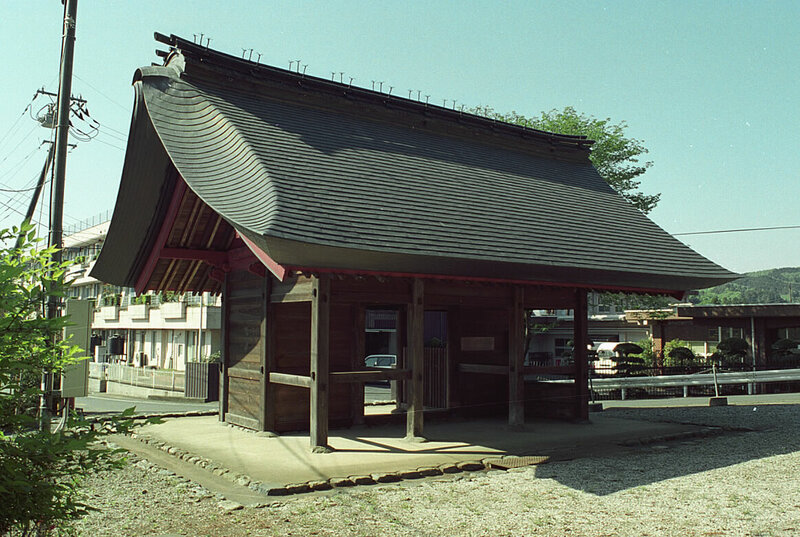 In Japanese architecture, unlike the continental antecedents, there is a division in the roof between the exposed elements, like the eave and exposed boards in the gable end, and the hidden rafters which are actually producing the roof surface. When you break up the structural from the exposed components, there is of course an increase of complexity, however what opens up as well is a huge range of design possibilities. If the roof is only single layer, and you want to curve the rafters, then the gable barge board must be curved exactly to match the roof’ profile. And since the common rafters are normally carried upon lengthwise purlins in the roof, the attachment of the verge boards, given their tall profile, is tricky. Ideally you would want to employ the purlins to carry the verge boards, or hafū, at their lower surface, just like the way the rafters are carried upon the purlins and ridge. So, attaching the hafū boards to the purlins is one hassle in a single layer roof, especially when you want to accomplish it with joinery. And of course, the normal treatment with the gable end hafū is to place a board along their top edge which climbs with them to the peak, the nobori uragō as it may be termed. Adding more height in this area compounds the problem of fitting these wood pieces to the rest of the roof structure. The verge board assembly is in fact wanting to be higher than the rest of the surrounding roof surface. And this is what you will commonly see on Chinese gabled or hip gabled roofs – the end of the roof and ridge meet the gable edge and turn up slightly (or not so slightly a lot of the time it would appear). By dropping the entire hafū and nobori uragō assembly down, in the double roof system, the problems of attaching the assembly to the purlins, along with the roof surface problems are solved. It means adding ‘dummy’ purlins and ridge pieces to carry the assembly in the gable, which is certainly an increase in framing complexity. These ‘dummy’ purlins and ridge, while sitting below the actual roof purlins and ridge, are not simply tacked on decoration – they do carry the weight of the verge board assembly just fine and mechanically connect to interior framing members. From the outside, looking up at the gable one can glimpse these exposed purlin and ridge pieces, and thus the structure looks as it should. 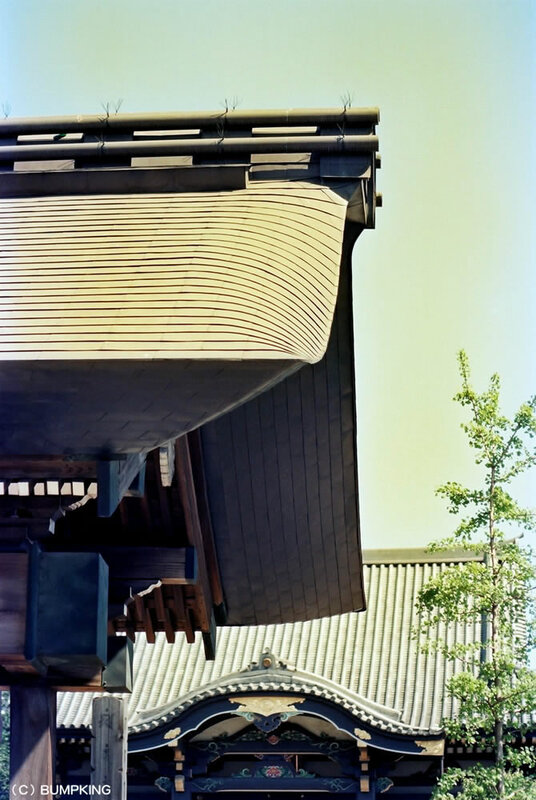 Much more important than these visual sleights of hand however, is that added bonus that comes with the double roof and the dropping of the verge board assembly down – now the shape of the hafū and nobori uragō are freed from the constriction of having to conform to the roof shape. The roof body can also be slightly convex (called “mukuri“), with either a flat or curved hafū in this structural arrangement. Having the double roof structural system, in summary, is incredibly versatile and opens up huge areas of architectural artistic expression. All of the buildings in the above photo, even the littlest ones, have a double roof structural system. 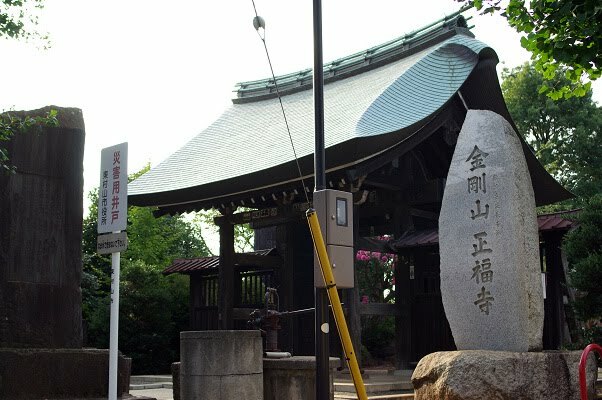 It’s the normal system in Japan for important traditional structures of many types. So ends our minokō diversion. I hope that I have managed to shed light on one of the lesser-known aspects of traditional Japanese architectural beauty, and to perhaps have given the reader an appreciation for all that goes into creating these sublime structures. Thanks for coming by the Carpentry Way today. Thanks Micheal, and Mum, for the comments, and so pleased you enjoyed the photos. Great works and blog. So much that I have added your blog to my very selective Blogroll. most honored that you would add me to you blogroll! I will check out your blog as well. I suddenly appreciated the elegant designs of the Japanese temples and buildings, especially the minoko roofs, which exhibit the uniqueness and elegance of the country's architecture. I like it when the copper shingles shine like a polished wood every time the sunlight reflects on them. “I like it when the copper shingles shine like a polished wood every time the sunlight reflects on them.” -well put! I very like your site. Thanks for sharing it with us. I want to build small addition to my existing house. Actually I want to put a roof above balcony and convert it to the room. I will be very happy if your give me some directions ( tech. books or websites ) how to build Japanese style copper roof and some technique how build smooth transitions. I appreciate your question, however I cannot point you to any resources giving directions as to how to build a Japanese roof with copper shingles. There are many diverse resources which give information on selected aspects of that work, but nothing comprehensive.